Kybella® – tighten and rid yourself of that double chin! This is how Kybella® works. Your liver creates an enzyme that gets stored in your gall bladder. When you eat fatty foods, your gall bladder releases that enzyme in order to digest the fatty food. That enzyme that gets injected into your chin area. The enzyme then digests your fat cells in your chin line. You will get immediately swollen and sore. You feel a burning sensation, which is your fat cells being digested. It does take two months for your lymphatic system to remove the digested fat from your body. It really does take that long to see the swelling subside completely. The injections are quick, you really don't feel them. However, immediately after you will burn. It’s not intolerable, icing really helps. Accent Prime is our newest Radio Frequency device. RF Radiofrequency helps stimulate your own collagen production. Accent Prime RF device is used to produce deep thermal heating to the tissue. You get an immediate tightening of the collagen fibers, so it's great to do before an event. However, to achieve collagen remodeling we recommend weekly treatments for 5 weeks. According to Wikipedia "tissue remodeling is the reorganization or renovation of existing tissues". Doesn't that sound good! Accent Prime also has an ultrasound attachment. 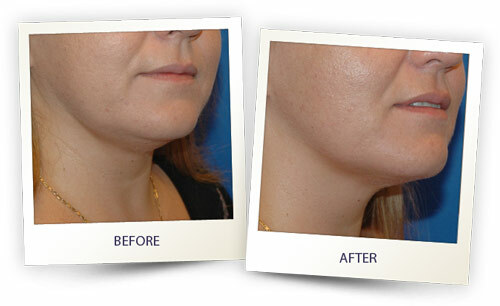 Ultrasound is used on the neck area to address the double chin. The ultrasound evenly distributes acoustic vibrations to the layers of adipose (fat) tissue, destroying the cellular membranes of the fat cells, which are then excreted by your lymphatic system system.